We love Crazy Egg at Boutique Business Consulting. Crazy Egg gives you another view of how customers use your website. Crazy Egg should be used in addition to Google Analytics. Crazy Egg uses Heat Maps. What is a heat map? 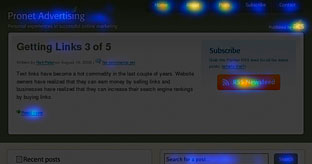 A Heatmap is an easy way to understand what users do on your site. It’s a visual representation showing you where users click and what they do. We used Crazy Egg on a client's website. The site had a sales category but didn't always have items on sale. Nearly every visitor to her site went to the sales category first. She now makes sure that there are always items in the sales category. Once this change was made sales increased. Crazy Egg takes the guessing out of website design. Crazy Egg will show you if people are firstly seeing different parts of the website and secondly if they are clicking on it. For example all our Shopify websites have the newsletter sign up in the footer however people often don't scroll down to the bottom of the screen - therefore they don't see the sign up box. The sign up box needs to be moved further up the page. Crazy Egg comes with all the reports listed below. If you would like to use Crazy Egg on your website. Contact us today.